Big banks are raking in monster profits -- and they can thank President Trump for their success. Trump's corporate tax cuts helped fuel Wall Street's blockbuster first-quarter results. Ditto for the recent market mayhem, which Trump played a starring role in at times. Morgan Stanley and Bank of America (BAC) both revealed record quarterly earnings this week. A critical measure of profitability at Goldman Sachs hit a five-year high. And banking king JPMorgan Chase (JPM) hauled in $8.7 billion during the first three months of 2018. That's the largest quarterly profit by any US bank -- ever. Big banks are also cashing in on the stronger economy, which has modestly increased demand for mortgages, car loans and business borrowing. "The results are certainly very impressive. The underlying fundamentals of banking is quite strong," said Nicholas Colas, co-founder of DataTrek Research. The industry got a huge boost from the Republican tax law. Banks traditionally pay high tax rates, making them among the biggest winners from the corporate tax rate falling from 35% to 21%. Bank of America's bill to Uncle Sam plunged by 26%, even though the No. 2 US bank earned 30% more. Morgan Stanley's (MS) effective tax rate tumbled to 21% from 29% last year. The effective tax rates of JPMorgan, Citigroup (C) and Wells Fargo (WFC) also dropped sharply. Big banks have also cashed in on the return of volatility to Wall Street. The market drama, driven by Trump's trade crackdown as well as plunging tech stocks and fears about inflation, boosted trading activity as clients rushed to execute orders. That's a big moneymaker for Wall Street firms, which suffered from an unusually tranquil 2017. "Last year was the best environment for investors and worst for trading desks. There was very little volatility," said Colas. Boosted by the market chaos, Morgan Stanley's sales and trading revenue soared by 25% to $4.4 billion last quarter. The investment bank cited "higher levels of client activity." Bank of America's stock trading revenue surged by 38%. Trading revenue at Goldman Sachs (GS) soared 31% to a three-year high. Goldman Sachs rewarded its employees handsomely: the average worker made $110,000 during the first quarter, up from $96,500 last year. Goldman Sachs CEO Lloyd Blankfein chalked up the increased volatility to central banks dialing back crisis-era programs that subdued market turbulence. "I wouldn't say we're popping champagne corks," Blankfein told CNBC on Wednesday, "but we can certainly see what happens when we start to walk back towards a normal financial market." 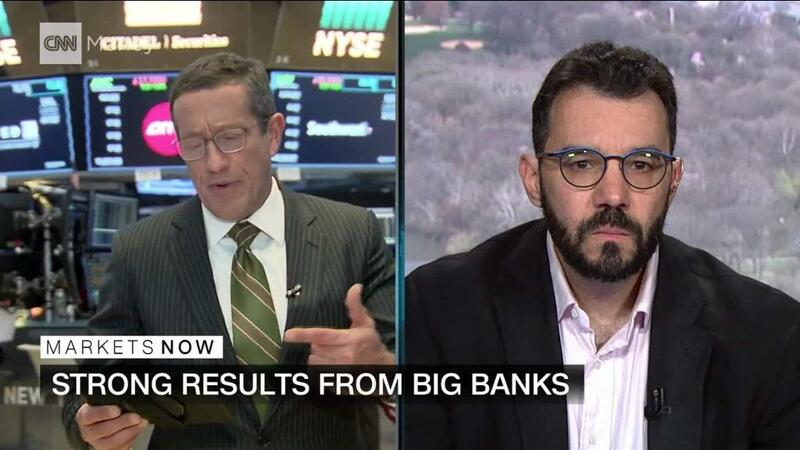 The news wasn't great for all big banks. Wells Fargo's stock dropped after the bank warned it faces a potential $1 billion penalty for auto and mortgage. The embattled bank warned it may need to revise its first-quarter earnings. Wells Fargo is also grappling with sanctions from the Federal Reserve that limit its asset size to $2 trillion. Other banks' strong earnings haven't really impressed shareholders this quarter. One concern is that big banks are benefiting from powerful, but fleeting forces: volatility and tax cuts. The core business -- lending -- doesn't look as strong as some hoped given the strong economy and the positive impact of the corporate tax cuts. For instance, JPMorgan said its commercial and industrial loans rose 5% from last year but were down 1% compared with the fourth quarter. Marianne Lake, JPMorgan's chief financial officer, described during a call with analysts an "overall industrywide slowdown" in lending. Lake said JPMorgan expects modest lending growth for 2018, but noted the bank is acting "very selective and cautious, given where we are in the cycle." Another problem looming on the horizon: the bond market is acting up again. Short-term Treasury rates have jumped, while long-term rates are shrinking. That's known as a "flattening" yield curve and it's bad for banks, which pay interest on short-term rates and lend at long-term ones. These dynamics help explain why investors aren't rushing to buy bank stocks right now. Colas said that despite their success, big banks are trading at roughly the same valuations as last year. "While banks are earning very strong profits, investors are reluctant to reward them," he said.